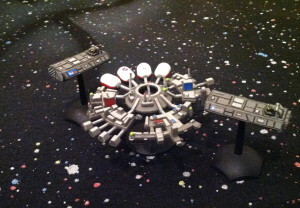 Remember how I kept mentioning Brigade Models ships during my post about the Belter Space Station? 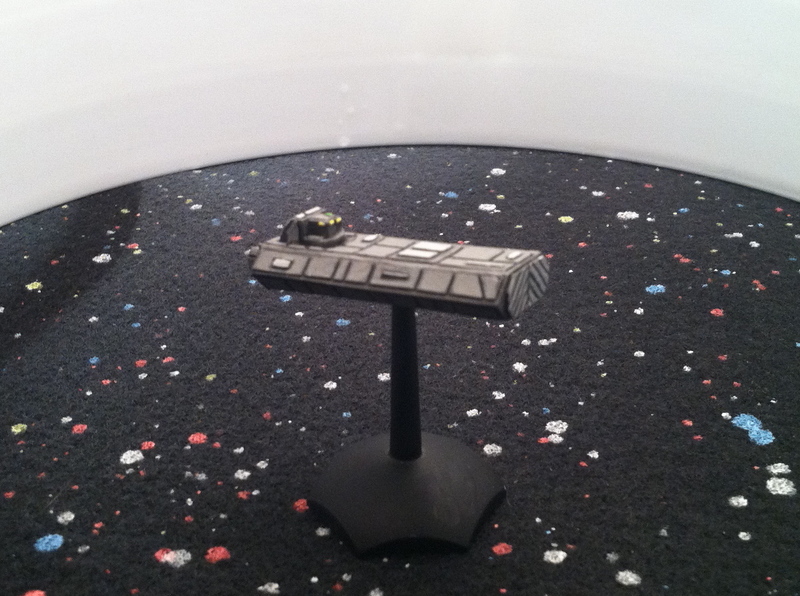 Well, I had an order of their merchant ships to repaint, so I figured I’d give context to what I was talking about. On the left are two Modular Container Ships. This post is not about them. Like a bunch of my ships, these had been sitting around a while. I’d speed-painted them to get them on the tabletop for a game: they were primed black, and dry-brushed silver, and barely serviceable. They looked about as good as they do in this picture, which is after step two of the repaint. 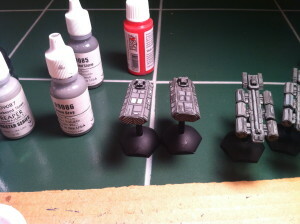 Step one was throwing a base coat of that Reaper Stone Grey, and step two was the wash. In this case it was a 50-50 mix of GW Lamia Medium and Nuln Oil, using the cheap drug store eyedroppers that you see in the picture. The technique really brings out the detail, but it darkens the miniature. The clean-up after the wash. I decided to match the freighters schematically with the space station, seeing as they were probably going to be required to switch sides constantly. 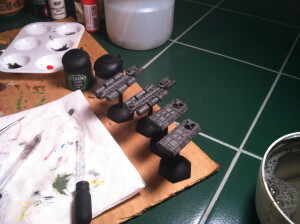 In the picture above, the freighter on the left has had its wash cleaned up and some of the higher features picked out with Reaper Weathered Stone. At this point, I should mention that there’s only one really good place for that FedEx logo on this model, and you’re looking at it. Unfortunately, the really cool arrow that’s hidden in the negative space on the logo is pointing the wrong way on the freighter, but there’s no good spot on the starboard side. Yes, that logo is painted on, and your little fingernail is probably three times as wide as the logo is tall. (I’m nuts.) The tool of choice was a Winsor & Newton 000 Cotman. If you don’t trust yourself with the expensive Winsor & Newton brushes, the Cotman series is the one for you. The FedEx’s sister ship, the Maersk. Here, I’m experimenting with a home-made light box, trying to get better pictures. 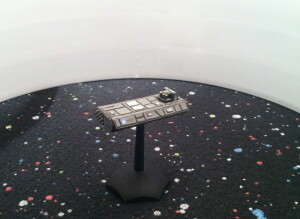 Inside the light box is the other freighter, this one with a Maersk logo painted on. That blur just aft of the logo is “MAERSK” in the proper font and everything. That wasn’t painted on: instead, I used a Black 001 Micron pen. It looks great in person, but Microns seem to disappear in pictures, and I don’t know why. 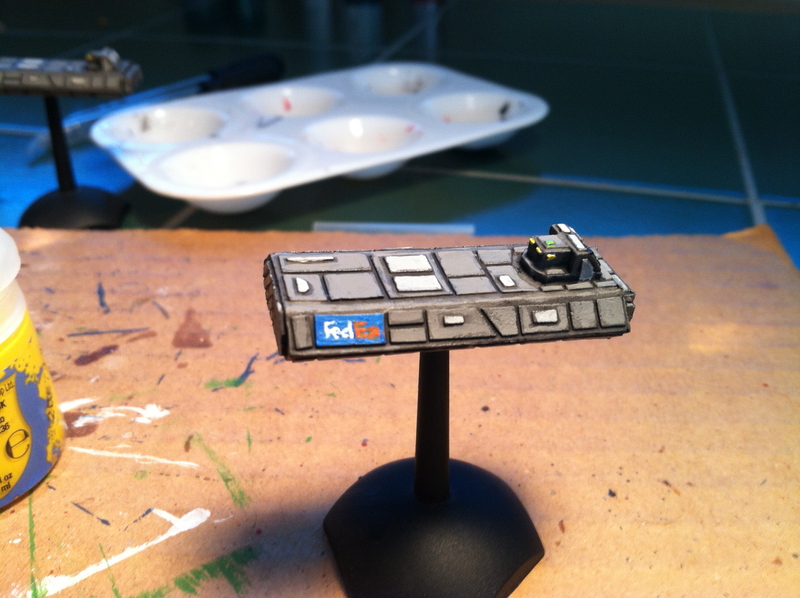 Starboard side of the FedEx. Here’s what I was saying about the starboard side. 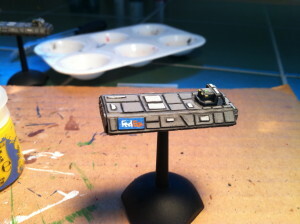 In order to get space for a logo, you need to get in and fill gaps or remove detail with putty. FedEx and Maersk visit La Grange. So here’s an action shot of the Belter Station with FedEx on the left and Maersk on the right. See what I was saying about how the bare spaces matched? Note that La Grange appears lighter than the freighters. This is primarily a side effect of that wash I’d started with — both in the dulling nature, but also because Nuln Oil is much darker than the Shadowed Stone I used for the lining on La Grange. My experience with Brigade Models is limited primarily to these miniatures. The models themselves are well-cast, with minor trailings on the aft end of the boat that were easily removed. There are two minor casting issues worth mentioning. The first is that all the worst flash is attached to the engine nozzles, so you’ll either want to leave them dark (like I did), or go to the trouble of drilling them out so that you can properly light them up. The second is that the bases provided by Brigade don’t really fit the models that well. I’d rate the heavy freighters a 4 out of 5. Leanne put together a composite of two pictures of Titan that were taken by the Cassini space probe. One is a near-infrared photo of the surface, and the other is in a true color. 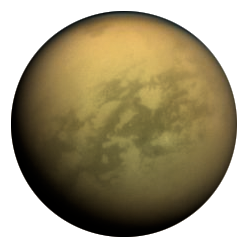 Putting the two together gives you a hint of what Titan might look like on a “clear” day.